The removal of concrete formwork also called as strike-off or stripping of formwork should be carried out only after the time when concrete has gained sufficient strength, at least twice the stress to which the concrete may be subjected to when the formworks are removed. It is also necessary to ensure the stability of the remaining formwork during formwork removal. The rate of hardening of concrete or the concrete strength depends on temperature and affects the formwork removal time. For example, time required for removal of concrete in winter will be more than time required during summer. Special attention is required for formwork removal of flexural members such as beams and slabs. As these members are subjected to self-load as well as live load even during construction, they may deflect if the strength gained is not sufficient to handle to loads. To estimate the strength of concrete before formwork removal, the tests on concrete cubes or cylinders should be carried out. The concrete cubes or cylinders should be prepared from the same mix as that of the structural members and cured under same circumstances of temperature and moisture as that of structural member. When it is ensured that the concrete in the structural members has gained sufficient strength to withstand the design load, only then formworks should be removed. 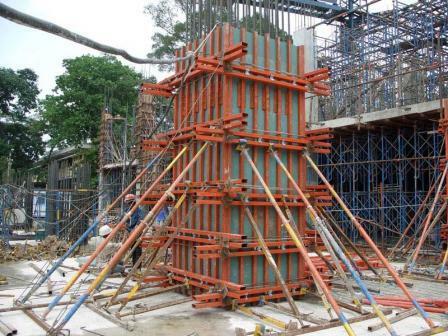 If possible, the formworks should be left for longer time as it helps in curing. physically damage the structural member when formwork is removed. after formwork striking. If there is a significant risk of any of the above damages, it is better to delay the removal time of formwork. If formwork have to removed for optimising the concrete construction activities, then these structures must be insulated well to prevent such damages. Structural members are constructed based on designed load. But before a structure is complete and subjected to all loads assumed during structural design, the structural members are subjected to its self weight and construction loads during construction process. So, to proceed with construction activities at a quicker rate, it is essential to calculate the behaviour of structure under is self load and construction load. If this can be done and structural member is found to be safe, formwork can be stripped-off. This formula was given by Harrison (1995) which describes in detail the background of determination of formwork removal times. Other method to determine the strength of concrete structure is to conduct the non-destructive tests on structural member. Grade of concrete – higher the grade of concrete, the rate of development of strength is higher and thus concrete achieves the strength in shorter time. Grade of cement – Higher cement grade makes the concrete achieve higher strength in shorter time. Type of Cement – Type of cement affects the strength development of concrete. For example, rapid hardening cement have higher strength gain in shorter period than the Ordinary Portland Cement. Low heat cement takes more time to gain sufficient strength than OPC. Temperature – The higher temperature of concrete during placement makes it achieve higher strength in shorter times. During winter, the concrete strength gain time gets prolonged. A higher ambient temperature makes the concrete gain strength faster. Formwork helps the concrete to insulate it from surrounding, so longer the formwork remain with concrete, the less is the loss of heat of hydration and rate of strength gain is high. Size of the concrete member also affects the gain of concrete strength. Larger concrete section members gain strength in shorter time than smaller sections. Accelerated curing is also a method to increase the strength gain rate with the application of heat. Generally following values of concrete strength is considered for removal of formwork for various types of concrete structural members. It is important to note that the time for formwork removal shown above in Table -2 is only when Ordinary Portland Cement is used. In normal construction process Portland Pozzolana cement is used. So, the time shown in Table-2 should be modified. Rapid Hardening Cement – stripping time of 3/7 of the time stated above (Table-2) will be sufficient in all cases except for vertical sides of slabs, beams and columns which should be retained at least for 24 hours. Formwork should not be removed until the concrete has developed sufficiently strength to support all loads placed upon it. The time required before formwork removal depends on the structural function of the member and the rate of strength gain of the concrete. The grade of concrete, type of cement, water/cement ratio, temperature during curing etc. influence the rate of strength gain of concrete. The formwork parts and connections should be arranged in a way that makes formwork removal easy and simple, prevents damage to concrete and formwork panels so that it can be reused without extensive repair. The formwork removal procedure should be supervised by the engineer to ensure that quality of hardened concrete in structural member, i.e. it should be free from or has minimum casting defects such as honeycombing, size and shape defects etc. These defects in concrete influence the strength and stability of structure. Thus immediate repair works can be done or the members can be rejected. The separation of forms should not be done by forcing crowbars against the concrete. It may damage the hardened concrete. This should be achieved by using wooden wedges. Beam and joist bottoms should remain in place until final removal of all shoring under them are done. 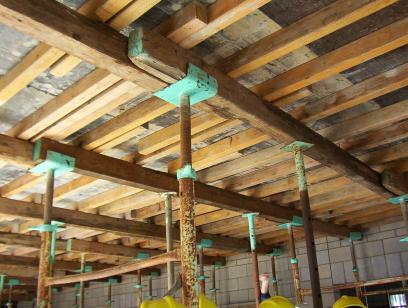 Joist forms should be designed and removed so that the shores may be removed temporarily to permit removal of joist forms but must be replaced at once. The shores and joists will be dismantled beginning from the middle of the member’s span, continuing symmetrically up the supports. The approval from the engineer should be obtained for the sequence and pattern of formwork removal. ACI (1995) In-place methods to estimate concrete strength. ACI 228.1R-95.